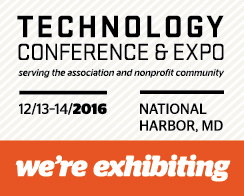 Accelera will be exhibiting at the Nonprofit and Association Technology Conference and Expo on December 13 & 14. We will have cloud and mobility experts at our booth, please stop by and see how Accelera can help you with your association’s initiatives . If you are already going to the event, please request an appointment to speak with us here. Learn more about the Nonprofit and Association Technology Conference and Expo here.